A passion to create beautiful things from her experiences has given multi-talented Liz Hicklin a rich life. Many years ago I ran a race through London; it took me hours because I stopped and took photos of all the landmarks along the way. So imagine running along the Great Ocean Road, where every bend reveals another picture-perfect scene; it would take me days. Surprisingly, the best runners in the GMHBA Great Ocean Road Marathon complete the course in just over two-and-a-half hours; I’m guessing they don’t carry cameras. For this trip, however, I cruise the stunning 44 kilometres between Lorne and Apollo Bay with the roof down on a Holden Cascada convertible. My mission is to find some fun activities for those cheering on the runners in next month’s marathon. Caught up in Melbourne’s daily grind, it’s easy to forget that the relaxed villages along the coast are so close; leave after peak hour and you can be in Lorne for lunch. The rainforest walk to the Sheoak Falls in the Great Otway National Park just outside Lorne rewards with a picturesque flow of running water. Walks from the picnic area range from one to three hours. Wye River is our destination for the night, in one of the many accommodation options still open after the Christmas Day fires. Twisted metal ruins remind visitors of the homes lost and contractors are still cleaning up, but from Ocean Magic halfway up The Boulevarde, the view is as perfect as ever. As it is from what must be Victoria’s most scenic pub, the Wye Beach Hotel (if you stop for dinner, I’d highly recommend the duck curry). Old photos on the wall tell the story of timber felling and past fires, and remind us that the present scars will soon heal. There are few better ways to start your day than with a swim followed by a gourmet breakfast in the sun, and the Wye River General Store is the perfect place for this. Heading on to Apollo Bay, keep an eye out for koalas, especially near Grey River, and prepare to stop at Carisbrook Creek, where cairn building has spread like a rash across the beach and warrants a photo or 10. Our night’s accommodation, Waters Edge townhouse, is aptly named. You can almost feel the sea spray from the deck with its view. Luckily the township is an easy beach walk, because my hubby has his heart set on the beer tasting paddle at the Great Ocean Road Brewhouse. They also offer a gourmet take on traditional pub meals, including a sampler of local goodies; heaven on a breadstick. Next day we have an early tour booked at the Cape Otway lighthouse. By the time we’ve taken in a few million years of history in the dinosaur exhibition we are ready for the full breakfast on the cafe’s sunny patio. Next it’s time to test the Cascada on some shady curves as we head inland. Off the main drag at Forrest, the brilliantly named Wonky Donkey is well set up for families, with a playground and kid-friendly meals. Managers Ruth and Justin Mason also run the Forrest Caravan Park opposite, as well as the nearby Planet Mud outdoor adventure centre. There’s paintball for groups and, for $50, Justin will strap you into an inflatable ball, roll you down a slope and call it zorbing. But we chose the more sedate off-road Segway tour. What an excellent, easy-to-learn, low-impact way to explore the bush. 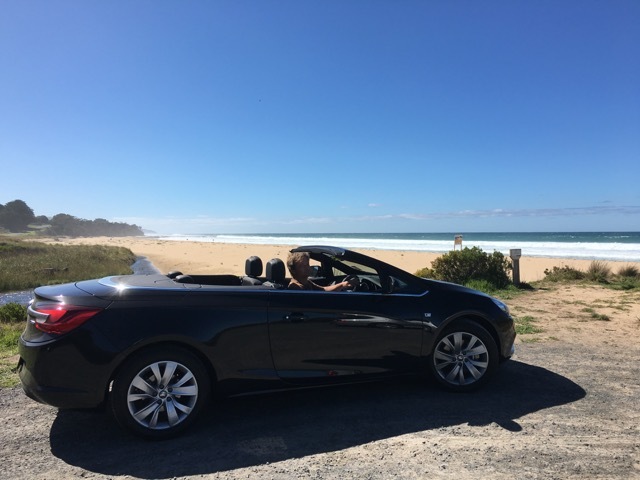 Inevitably reality calls us back but at least riding home with the top down in the Cascada makes the magic last a bit longer. WHAT’S ON: GREAT OCEAN ROAD MARATHON, MAY 2016 The GMHBA Great Ocean Road Marathon offers a range of events, from a 60-kilometre ultra marathon to a 1.5-kilometre kids’ gallop, over the weekend of May 14-15.